Okay, so this is the most handsome family ever!! Those kids are so cute! 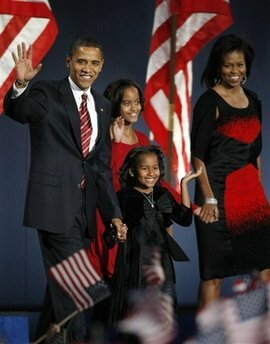 Now, I’m not gonna talk about Michelle’s dress ( it was a Narsico Rodriguez, from the RTW 2009 Spring Collection). I’ll just say that she could have made a better choice. 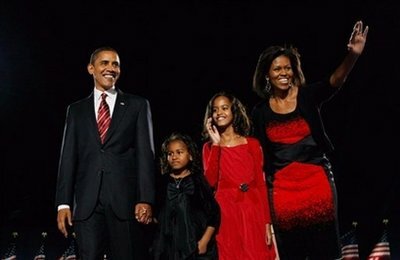 However, we have 4 more years for Michelle to look extra fab. Wait until the inagural ball!! You know your girl is gonna show out! I am so excited. Previous postMy thoughts on OBAMA’s win . . .